Take the guess-work out of selecting complementary tables and barstools by choosing this Lancaster Table & Seating 30" x 48" reversible cherry / black bar height dining set! This bar height table comes complete with everything you need to quickly and easily assemble a classic 4-top table. From the strong, sturdy cast iron base plate and spider, to the sleek black column and durable laminated table top, this table is an all-in-one addition to any establishment. This table comes with a reversible cherry / black table top. Black vinyl molding protects it from chipping and scuffing, extending the life of the table while adding a polished presentation. Choose cherry for a classic look or black for a modern touch. The attractive laminate on either side is easy to clean, requiring no maintenance or special chemicals. The versatile 30" x 48" design comfortably seats 4 guests without taking up too much room, making it the perfect choice for any restaurant, pizza shop, or cafeteria! This table's eye-catching table top is accented and supported by the included table base. A 37 1/2" high black powder-coated steel column and rod extends the table top to bar height and is connected to the table top via a black, powder-coated 10" spider attachment. At the base of the table, a 30" x 30" black, powder-coated cross base plate helps to prevent the table from wobbling, ensuring stability and balance. A 12-piece floor glide and screw hardware kit attaches to the base, further assisting in leveling the table while preventing the base from scratching the floor. This table comes unassembled to save you on shipping costs. 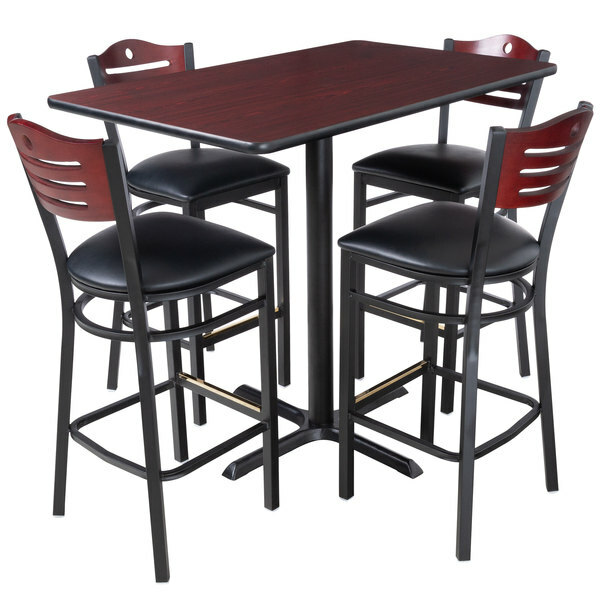 Choose from a set of four sleek black cross back barstools with padded seats or versatile mahogany finish eagle back barstools with wooden or padded seats. Table Top Thickness: 1 1/8"